Join Windy City Westies Dance Club as we host dances on at Chicago Dance Factory in Villa Park. We focus primarily on West Coast Swing , but include a dash of salsa, night club and two step. Come early for beginner & intermediate workshops with the nation's favorite dance professionals! Brittney Valdez has been a ballroom instructor for just over a decade. Her road to dance was a long one and a bit of an unexpected turn to those who knew her best, but it seems in finding dance, she also found her calling. She started out her dance journey as a college kid looking for something fun to do in her free to time. 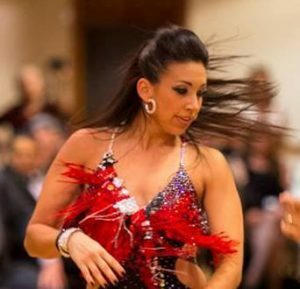 She was introduced to salsa dancing and a variety of other ballroom dances in her time at the University of Illinois Champaign and was instantly hooked. In 2006, at the age of 21, Brittney found her place at Fred Astaire Buffalo Grove with the encouragement of Norm and Heidi Lucky. She saw much success in her 5 years with the franchise, due to their high expectations on top of her own and access to training from some of the best dancers in the country. By the end of her 5 years she was both regionally and nationally ranked numerous times as both an instructor and a competitor. Her crowning achievement was clinching the title of 2010 United States Rising Star Rhythm Champion with her then partner, Aleks Nashev, a great close to an undefeated year in the Rising Star division. Brittney has been working for herself for the last 6 years during which time she’s had two kids and married the love of her life With a more flexible schedule she been able to tackle other styles of dance such as West Coast Swing where she is currently an Advanced level dancer, as well as Country Western, the social aspects of which have had a great impact on her dancing. She began a new competitive journey last August with her partner Eric Nava on the UCWDC circuit. They started this year off with a bang finishing 2nd place in Division 1 at the 2017 UCWDC Worlds to a couple from Belgium. Brittney also had the privilege of learning from and competing with the ever- talented Gary McIntyre this past year. He is an Open finalist in American Smooth, a World Champion many times in Country Western, and a Champion Level West Coast Swing dancer. Together they won 1 st place at Worlds giving Brittney her first ever World Champion title on the UCWDC circuit. Brittney shares a passion for dance not only as a competitor, but also as an instructor, and most of all as a social dancer. We're conveniently located off of the Villa Park Metra stop at Chicago Dance Factory Dance Studios.